Figure 1. 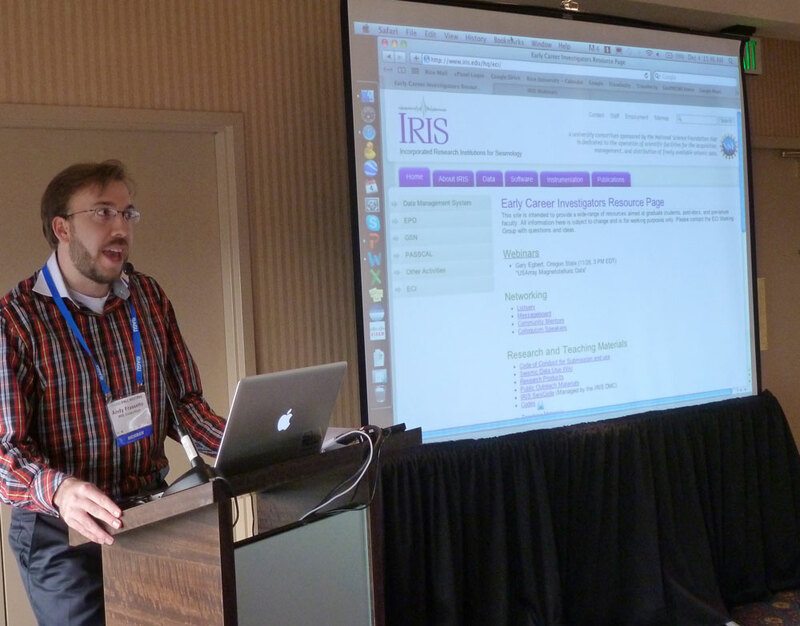 Andy Frassetto (IRIS) introduces the current ECI webpage and plan for the mini-workshop. 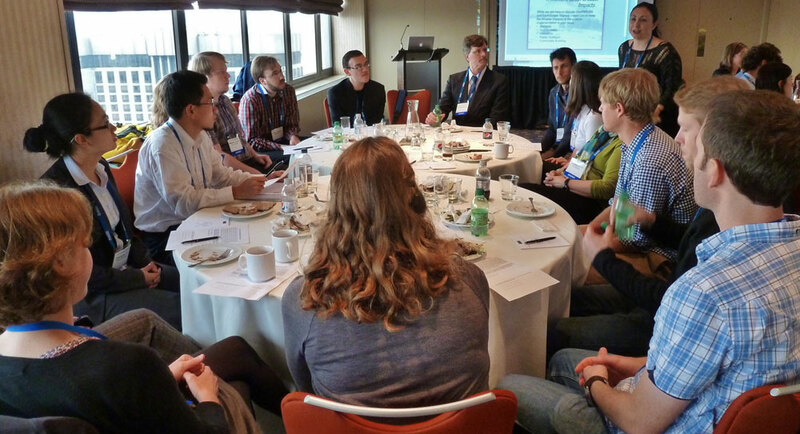 On December 4, 2012, GeoPRISMS and EarthScope co-sponsored an Early Career Investigators (ECIs) mini-workshop and luncheon in the Bayview Room of the Grand Hyatt San Francisco. The purpose of this function was to discuss research interests and explore potential collaborations based on shared GeoPRISMS and EarthScope focus sites and themes. This workshop also served as a networking function for ECIs to stimulate cross-disciplinary interaction and raise awareness of available professional resources for young geoscientists. The annual AGU meeting was an opportune time to hold such a workshop because it is the most attended conference of the year. This allowed for participation of ~60 ECIs from a wide range of academic disciplines, which include geophysics, geochemistry, and geology. ECIs are loosely defined as senior graduate students through pre-tenure faculty. The IRIS ECI working group serves to interact with, understand the needs of, and develop resources for this community. The mission of the working group is to organize a suite of resources and mentorship opportunities for ECIs as they navigate professional challenges such as completing graduate school, applying for a post-doc or first professional job, and acquiring permanent employment or tenure at an academic institution. The general goal of this effort is to lower the energy and knowledge barriers necessary to thrive in a range of environments as a newly minted educator or researcher. The luncheon began with an introduction from the members of the IRIS ECI Working Group (Harmony Colella, Andy Frassetto, Derek Schutt, and Danielle Sumy) who organized the function. This was followed with an overview of the GeoPRISMS and EarthScope programs from Juli Morgan and Ramon Arrowsmith, respectively. Then three ECIs, Michael Rowe, Donna Shillington, and Maggie Benoit, provided summaries of the objectives for the primary sites where GeoPRISMS and EarthScope programs overlap: Cascadia, Alaska, and Eastern North America, respectively. The remainder of the time allowed ECIs to divide into groups based on their interest in a particular primary site. ECIs discussed the scientific questions of common research interests with potential collaborators. Figure 2. Harmony Colella (Miami University) discusses Alaska-related topics during the break-out session. An unexpected, but positive, outcome of the networking function was 40% and 56% of participants had little to no previous knowledge of the science programs organized by GeoPRISMS and EarthScope, respectively. Additionally, 83% of the participants were exposed to the IRIS ECI program and its available resources for the first time. Surveys conducted immediately after the workshop suggest that the networking function succeeded in laying the groundwork for future interactions through ECI programs, future meetings, and one on one. Many ECIs were brought together for the first time and introduced to the scientific questions that are the core of the EarthScope and GeoPRISMS programs. They were exposed to the resources available through each of the programs as well as those being developed by the ECI working group. The organizers wish to thank several of the more experienced scientists who attended the workshop and helped to inform the primary site breakout sessions. Their knowledge and insight was much appreciated by the working group and participants alike. GeoPRISMS/EarthScope Early Career Investigators Networking Luncheon, Colella H., Sumy D., Frassetto A., Schutt D.